The possibilities for model reuse extend beyond running time domain simulations. It is possible to reuse models so that they can derive component parameters or the required control inputs to meet the targets set for the overall system. 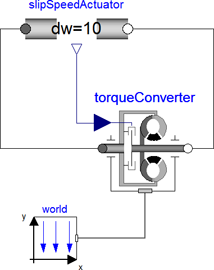 The example model below is able to determine the torque converter lock-up clutch clamp load required to meet the slip targets under different driving conditions. The impeller speed and torque and the slip speed target are specified and the required clamp load is then calculated. This is possible because symbolic manipulation is able to automatically rearrange the equations to solve for the unknowns in the system. By changing the actuators we can control what is known and unknown in the system and enable Dymola to solve the system of equations in different ways. We don’t have to make any changes to the component model itself to enable this type of calculation. This idea can be extended to calculate what a parameter value should be for a given set of boundary conditions. To achieve this we need to fully define the boundary and then tell Dymola which parameter value should be “free”, i.e. not specified, during initialisation. We then ask Dymola to solve only the initial condition problem and this will calculate the parameter value for us. Using the scripting language built in to Dymola we can then use these models to run a sweep of different boundary conditions to explore how the characteristics need to change across the range of operation.